Allons! Valentine Singers go to Amiens in spring 2010. 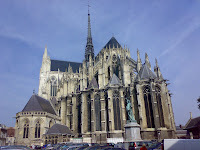 Staying and singing in Amiens, we shall also explore some other parts of the Somme area and we are very pleased to be giving a performance in the beautiful Eglise Notre Dame de Brébières in Albert.